Obesity in pets is a recurring topic. The number of pets that is (morbidly) obese is still rising. The percentage of cats and dogs dealing with mild to serious obesity is estimated at 35%. However, according to some sources this figure is actually up to 60%! Fortunately, there are plenty of things we can do to prevent obesity or provide your dog with a better lifestyle. Brands such as Fish4Dogs and Hill’s Prescription Diet offer healthy options for your overweight pet. Generally speaking, an overweight animal is an animal that weighs 5 to 10% more than its ideal body weight. In most cases, pets become overweight for the same reasons as humans - by eating too much and moving too little. Food provides energy. This energy is necessary to maintain the body and to be able to play and go for walks. If your cat or dog gets (too) little exercise, there is energy remaining. This excess energy is stored in the body as fat. When an animal is regularly getting more food than it actually needs, it will eventually become overweight. It is therefore important to carefully monitor the balance of food and exercise. Obesity can have many different causes. Often it is difficult to pinpoint one cause, and is rather due to a combination of factors. Eating too much and moving too little is the obvious answer. However, there are other factors that, separately or in combination, can have an effect on your pet's weight. Cats and dogs are often overfed, because their owners are afraid that their pet will get hungry, or because the pet begs for food. What's more, many animals are also treated to dinner leftovers or "human snacks", such as cheese or sausage, in addition to their own food. What people often do not realise is that, in terms of energy, giving a dog 2 slices of salami is the equivalent to a human eating one and a half hamburgers! And for cats, a small cube of cheese is the equivalent of a whole bar of chocolate for humans! In order to stay healthy, it is important for animals to get enough exercise. This applies to all animals, but especially those that are fed too much. 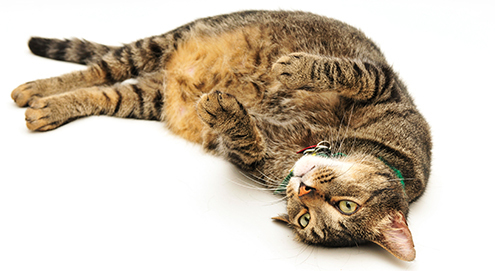 When an animal eats normal amounts but gets too little exercise, it may become overweight. Animals that eat too much and also barely get any exercise are far more likely to become overweight. Snacks are not only bad for humans, but for animals too. Of course animals do not eat crisps, candy or chocolate (in fact, chocolate is very dangerous for pets), but pet treats often contain lots of energy. When they are taken on a long walk or get plenty of exercise, giving your pet a treat is not generally a problem. But when you only give them treats for their delicious flavour, they can cause obesity. However, there are various responsible treats for dogs available. Where possible, giving your pet a snack should mean that you are reducing their normal meals accordingly. Spayed or neutered pets need far less energy than pets that have not been spayed or neutered. There is also special food for spayed and neutered cats and dogs available. These diets have a reduced energy content and usually contain added fibre to prevent the feeling of hunger. Older animals sleep more and generally get less movement compared to younger animals. As a result, they use up less energy and therefore need less energy from their food. You can choose to switch your pet to a so-called senior diet, made specially for older animals. This diet has a lower energy density and will contain added nutrients to support your ageing cat or dog's body. There are also medical causes for obesity. For example, when an animal has an under active thyroid, this increases the risk of obesity. The thyroid regulates the metabolism, among other things. If the thyroid is under-active, food will not be burned as quickly and more energy will be stored in the body. Conditions that restrict the animal's movement, such as osteoarthritis and joint problems, can also increase the risk of obesity. The use of certain medication may lead to obesity. In the first instance, obesity is visible due to the external symptoms. In animals that are a healthy weight, you should be able to see a waist when looking from above and when looking from the side the stomach should go up behind the ribs. If there is no defined waist, or your pet's stomach is as wide or even wider than its rib cage, it is possible that your dog or cat is overweight. It can be difficult to see the waist if your animal has long or thick fur. That is why is it also important to feel your pet. If you move your hands over your pet's rib cage, you should be able to feel its ribs without using too much pressure. If you cannot or barely feel the ribs, your dog or cat may be overweight. However, your pet's ribs should not be visible. This may mean that they are underweight. In terms of behaviour, you can tell whether your dog or cat is overweight if their fitness is reduced (short of breath), if they are constantly hungry, if they are more prone to heat or overheating (mainly in summer) and generally less lively and enthusiastic. To check whether humans are a healthy weight, we usually use Body Mass Index (BMI). For animals, we also have a system to score them objectively and class them in a certain weight category: the Body Condition Score (BCS). This scale goes from 1 to 9. Animals are given a score based on whether or not their waist is visible and whether or not their ribs can be felt. An animal with an ideal weight is given a score of 4 or 5. Each additional point means 10% of excess weight, and for every point below that score the animal is 10% underweight. From BCS 7, the animal is classed as extremely overweight or obese. Does your pet have a healthy weight? It is often difficult for owners to look at their own cat or dog and determine whether it is a healthy weight. If you want to know whether your pet is healthy, you can make an appointment with your veterinarian, who can check its weight and give a BCS score following a thorough examination. In the event of a high BCS score, your veterinarian can advise you on the correct approach to responsible weight-loss for your pet. A diet food often plays an important role in this. For example, Royal Canin, Trovet dog food and Specific all have special food ranges to help your cat or dog lose weight. For overweight (obesity) and diabetic dogs. Specially composed for older dogs, rich in Omega fatty acids. For dogs with diabetes mellitus. For overweight or obese cats. For dogs that require a high dietary fibre content. For overweight (obesity) and diabetic adult cats.